I have known Victoria for a number of years both personally and professionally, so of course I turned to her for help when I had problems with my 16.2 black gelding. He had taken to rearing and to be perfectly honest frightened the life out of me. Along came Victoria to the rescue. She spent the afternoon with us both and I was in awe of her, as was my boy. Victoria found he had problems with knots in his neck and the look on his face when she massaged him was hilarious. He was definitely in heaven :)). Then Victoria did join up with him. He responded very quickly and it wasn’t long before she was on him. He was like a different horse, confident, responsive and I think in love with Victoria. I can never thank her enough for what she did to allow my boy to live a pain free life. We will both be forever grateful. WOW is all I can say about this lady! 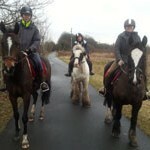 Victoria is very friendly, down to earth and VERY knowledgeable of horses. 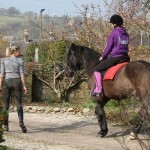 My horse Connor 5yr old Friesian x had a bad start to life and has serious trust issues. After a few weeks of being stabled & unridden had developed what I thought to be ‘naughty toddler syndrome’ where he would not allow me on his back – enjoying his very early retirement! The only time since January that I managed to lasted all of 3 seconds, he freaked, reared and had thrown me back off then went and sulked in the corner! Due to his bad start I didn’t want to force him or send him away to be schooled to have someone smack him if he was naughty he needed showing not everyone is out to hurt him I needed to get to the bottom of the issue. Victoria arrived at the yard this morning welcomed me with a hug and then got straight to work, finding lots of knots and tension throughout his left side causing him pain – within minutes she had not only made both of us feel at ease but had pinpointed the problem. After giving him a quick massage she took off to the school with him working on join up to gain his trust showing me the technique as she worked – this took a while but she got there and within 90 mins had him tacked up and was on him walking around. There’s still tension to release to get him moving freely and pain free & I will continue to work on join up & games daily and removing the pain memory he associates with me & mounting as well as his other memories from his past regarding men and farriers but we will get there. It was a very enlightening experience & I can’t recommend Victoria enough. Thank you for everything. I took him on the road today for the first time and he was very good. Rode out with another calm well behaved horse who he was very happy to follow and went passed his normal haunts ! He felt like he was actually happy to follow the horse in front today rather than trying to ram into them or jump on them ! He was good to girth up and has been since seeing Roy even though his skin around that area is still flaky and “burnt”. He was wierd when I did join up with him just galloped around bucking ! And I just stood in field and looked at him it was like he was trying to get me to play was swing his head about and kept doing fly passes past me in a nice why like he wanted me to chase him lol he did calm down on his own and followed me straight away. Victoria drove 3 hours to get to our yard to help us with a horse. She was friendly, cheerful and a great listener. Victoria spent all afternoon with us. She taught us how to join up and gave us lots of advice on handling, feeding and managing our horse. She also gave me useful tips and ideas that I have continued to use with great success. The horse was extremely relaxed in her presence. We are carrying out her suggestions with good results. We plan to keep in contact with Victoria and highly recommend her. I couldn’t even get onto my 8 year old cob without the help of others holding him still, then he would nap terribly when out – thanks to Victoria, I have my confidence back and a lovely horse that I can now get on alone and ride out peacefully – I am so happy – thank you so much. P.S. My horse seems a lot happier too. 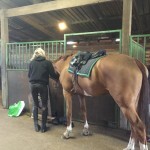 Victoria did an amazing job breaking my nervous Appoloosa Gelding… I realised very quickly he was nervous cause I was! We are now two happy hackers! After breaking my back in a bad fall …my confidence was destroyed and i decided to sell my much loved sec d… after victoria’s help and support I am know riding him and have decided not to sell him… I am so thankful i came across victoria! she is a legend! Victoria’s visit to my racing yard was very informative…not only did she sort out my most difficult flat race horse but we discovered the haylage was sprayed with chemicals… effecting the trainability of the yard..it now flows healthier and happier! Victoria visited me one windy wet day to load a difficult mare I had bred and wanted so badly to take to shows… After one session she was fixed! she is so relaxed traveling its hard to believe she was so misbehaved before.